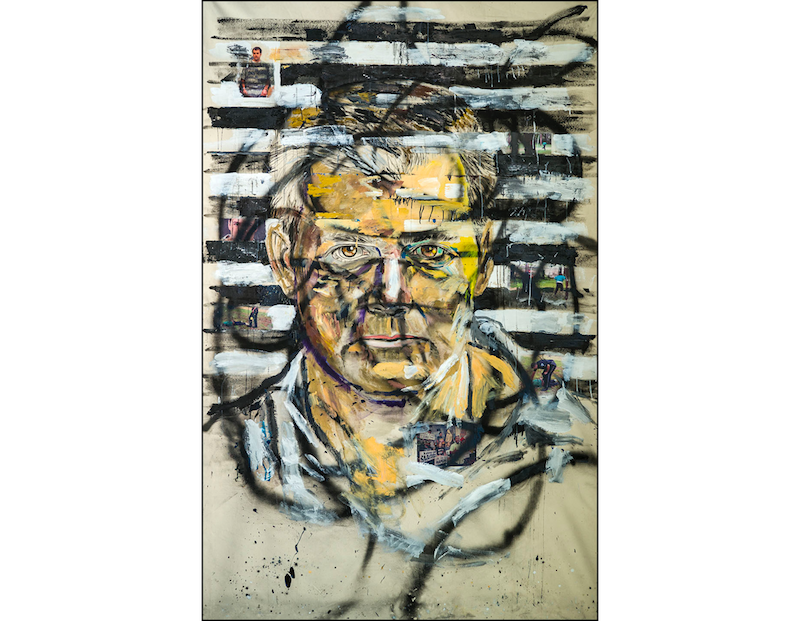 In the course of history, artists have taken on societal causes as subject matter. Photographers such as W. Eugene Smith, Alfred Stieglitz, Margaret Bourke-White, Dorothea Lange, Garry Winogrand and artists including Pablo Picasso, Francisco Goya, Andy Warhol, Leon Golub, Kerry James Marshal, Glenn Ligon and many more have used their art to provide a sympathetic voice to human injustice. Red Morgan, a highly recognized and awarded journalistic photographer has been photographing African Americans for more than 40 years. 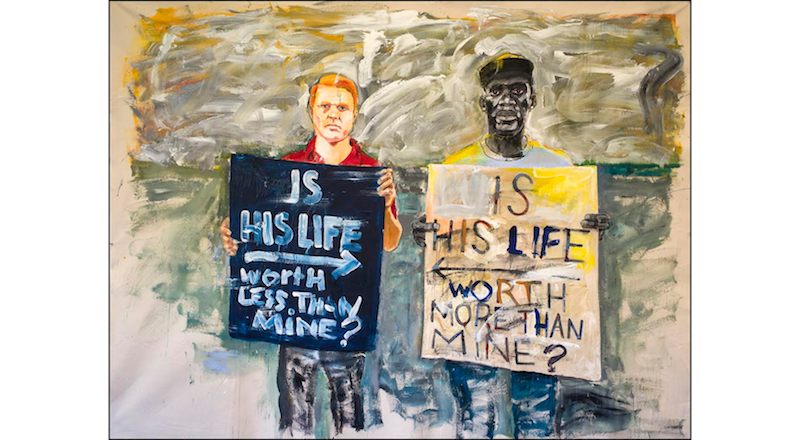 For the past three years, Mark Cohen has been creating large scale paintings that document the outrage of African Americans caught up in the deprivation of basic human rights and dignity. The question that their work seems to engender is "Why are two older white men doing this?" 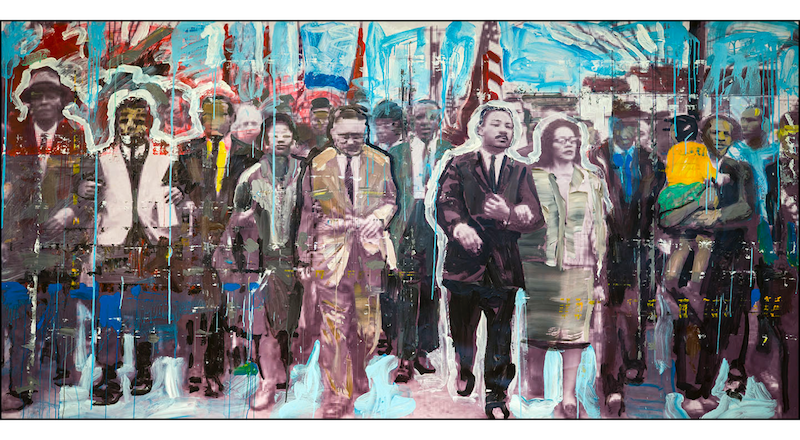 The answer is the time is right for artists of all colors to use their work to promote a discussion about social injustice in America. The photographs in this exhibition represent an entirely different universe from the paintings, and yet juxtaposed they portray a simpler, kinder life where aging and poverty take their toll rather than violence. 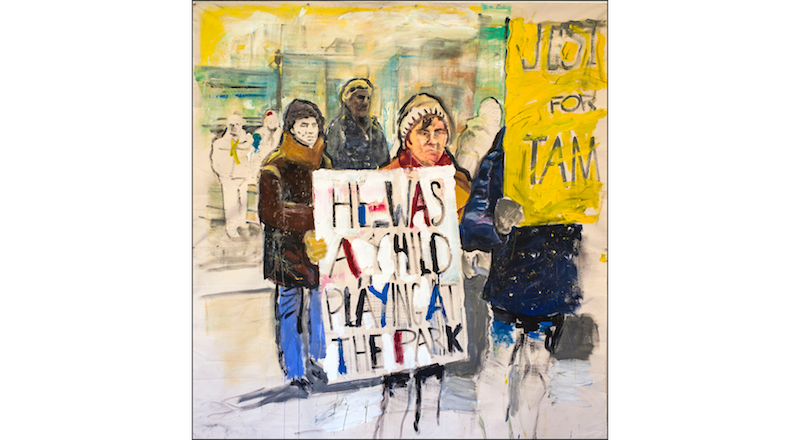 There is a certain but differing dignity attached to both the photographs and the paintings. 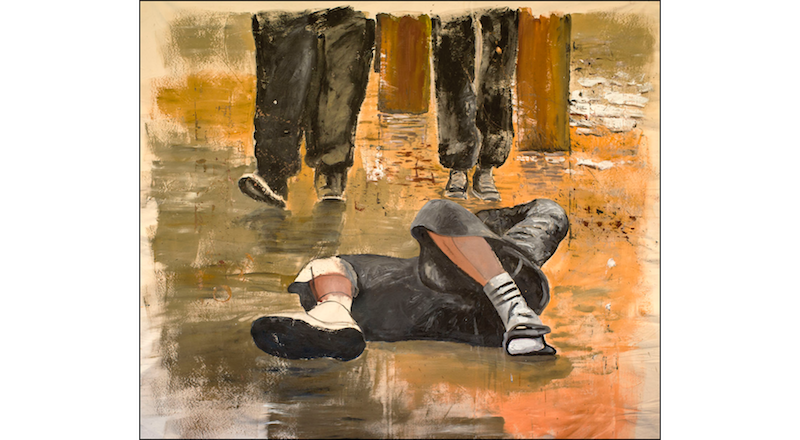 The paintings cover primarily urban life while the photographs focus more on rural themes. The paintings are timely while the photographs are timeless. The photographs capture the exuberance and purity of life while the paintings express the haunting, lingering specter of death. Harriet Tubman escaped from slavery in the South to become a leading abolitionist before the American Civil War. She was born into slavery in Maryland in 1820, and successfully escaped in 1849. Yet she risked her life and freedom and returned many times to rescue both family members and other slaves from the plantation system. Tubman led hundreds to freedom in the North as the most famous "conductor" on the Underground Railroad, an elaborate secret network of safe houses organized for that purpose. She also helped the Union Army during the war, working as a spy among other roles. After the Civil War ended, Tubman dedicated her life to helping impoverished former slaves and the elderly, establishing her own Home for the Aged. In honor of her life and by popular demand via an online poll, in 2016, the U.S. Treasury Department announced that Harriet Tubman will replace Andrew Jackson on the center of a new $20 bill. 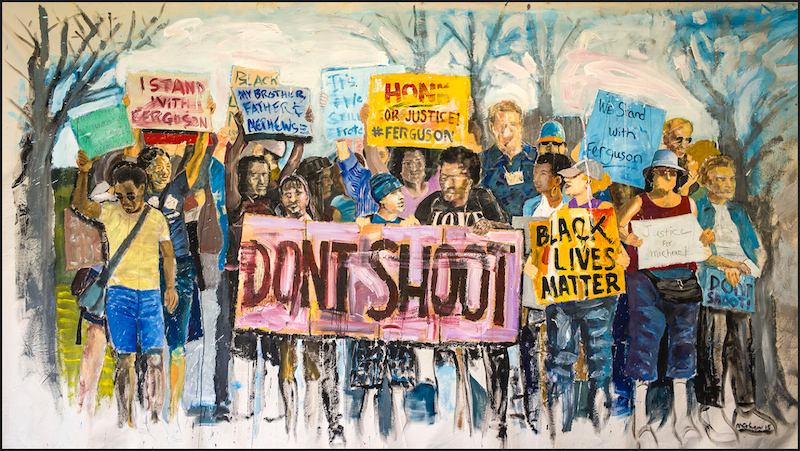 The shooting of Michael Brown occurred on August 9, 2014, in Ferguson, Missouri, a northern suburb of St. Louis. Brown, an 18-year-old black man, was fatally shot by Darren Wilson, 28, a white Ferguson police officer, after robbing a convenience store. The police officer did not know that a robbery had occurred. That killing illustrates the structures of racism and violence in America and how they perpetuate police brutality against Black Americans. 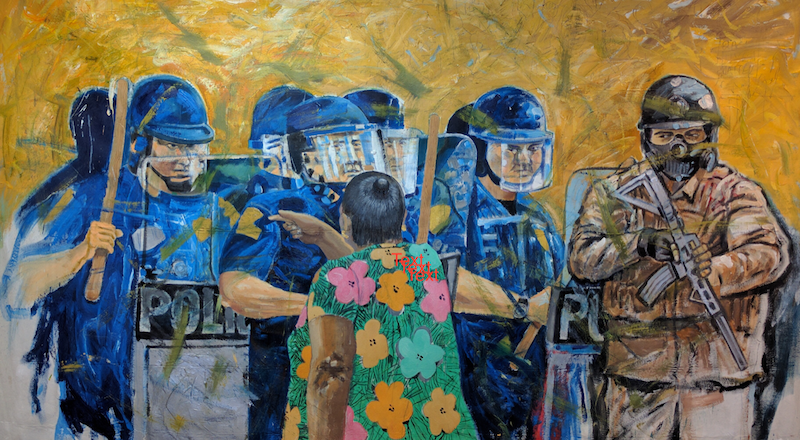 Police brutality is a national crisis, but the underlying structural violence - racism, economic injustice and militarism – is a national epidemic. Disproportionality in police use of force against Black Americans persists. An April 2013 report prepared by the Malcolm X Grassroots Movement found that killings of Black Americans by "law enforcement, security guards and stand-your-ground vigilantes” have increased from one every 36 hours, in the first half of 2012, to one every 28 hours by the end of that year. This appalling statistic is rooted in structural racism that systematically excludes persons of color from opportunities and perpetuates negative stereotypes. The intent of the Black Lives Matter movement is that "Black lives Should Matter.” After all, the fact they don't is the inherent injustice they are trying to amend. Black Lives Matter isn't a conclusion. It's an argument against an inequality in our system. When people say "All Lives Matter,” though, it's actually a lie. It's stating a conclusion that all lives matter the same. But they don't. And they never have. When the first slave ships started transporting blacks to America in the 17th century, black lives did not matter. For the next century, as the southern colonies built their economy on that slave labor, black lives did not matter. When sharecropping became the new de facto slavery after the end of the Civil War, black lives did not matter. When blacks were denied the right to vote until 1870—and the opportunity to do so for the next 90 years through Jim Crow law — black lives did not matter. When blacks finally won the appearance of equal rights, racist, redlining mortgage practices stripped away their homes, businesses and jobs. And their lives did not matter. 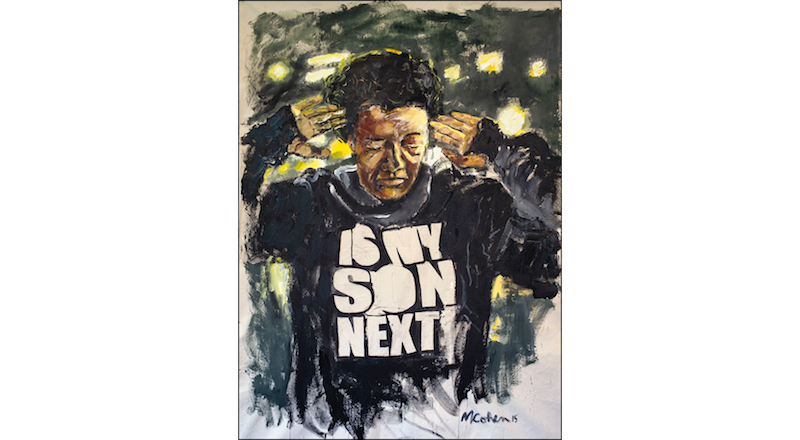 A protestor demonstrates in Ferguson, Missouri, wearing the sweatshirt that contains the phrase that all African American mothers and fathers live with on a daily basis – Is my son next? 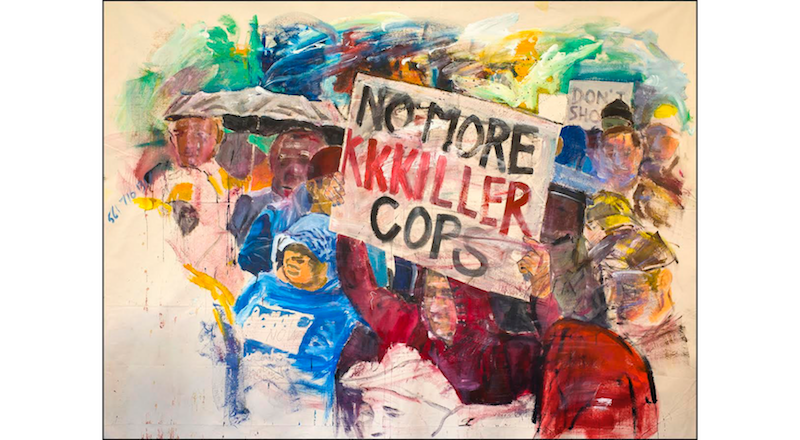 On November 24, 2014, a grand jury decided not to indict white Ferguson Police Officer Darren Wilson for killing black 18-year-old Michael Brown. The decision spurred protests nationwide and caused upheaval in the Ferguson, Missouri area. While some frustration over the decision resulted in violence, Brown's family joined President Obama and Attorney General Eric Holder in urging activists to protest the outcome peacefully, saying, "Answering violence with violence is not the appropriate reaction. 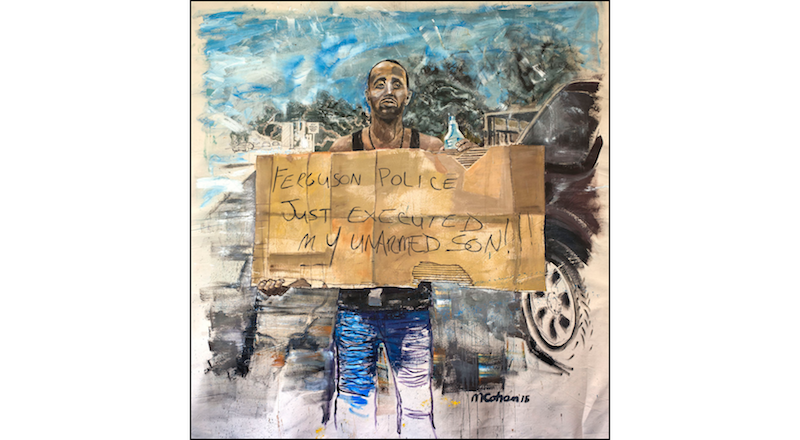 Let's not just make noise, let's make a difference.” Ferguson has been struggling to return to normal after Brown, an 18-year-old black man, was killed by Darren Wilson, a white Ferguson police officer, on August 9. His death sparked months of sometimes violent protests in Ferguson. A grand jury declined to indict officer Wilson. The transformation from "community policing” to "military policing” began in 1981, when the U.S. Congress passed the Military Law Enforcement Act, which encouraged the military to give local, state, and federal police access to military bases, intelligence, research, weaponry, and other equipment for drug interdiction. In the years that followed, Presidents Bush and Clinton embraced the War on Drugs and increased the transfer of military equipment, technology, and training to local law enforcement, contingent on the willingness of agencies to prioritize drug-law enforcement and concentrate resources on arrests for illegal drugs. During the Reagan administration and beyond, a drug forfeiture regime has proved to be highly lucrative for local law enforcement, offering the incentive to wage the War on Drugs. This enables local police departments to confiscate cash, cars, and homes of people suspected of drug use or sales. 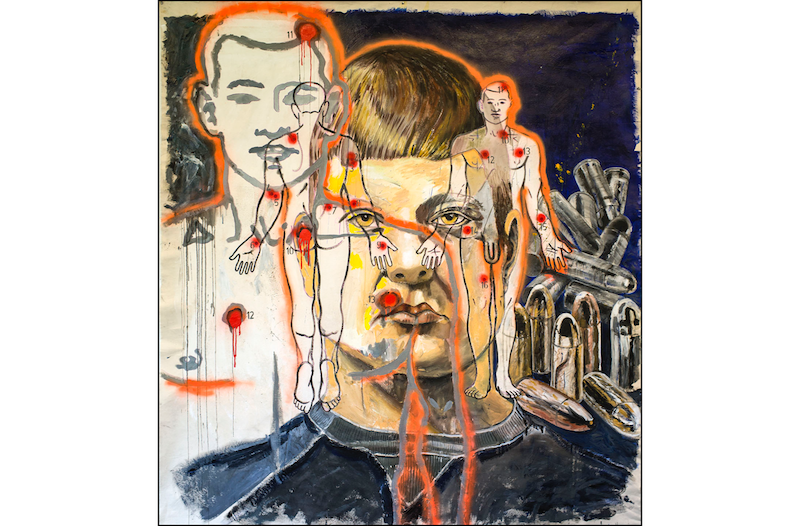 The painting illustrates a question that is often asked and for which there is no good answer. How do we determine the worth of a human being? Why do we even ask the question? How do we approach the concept of equality in America? Maybe that is the more important question. 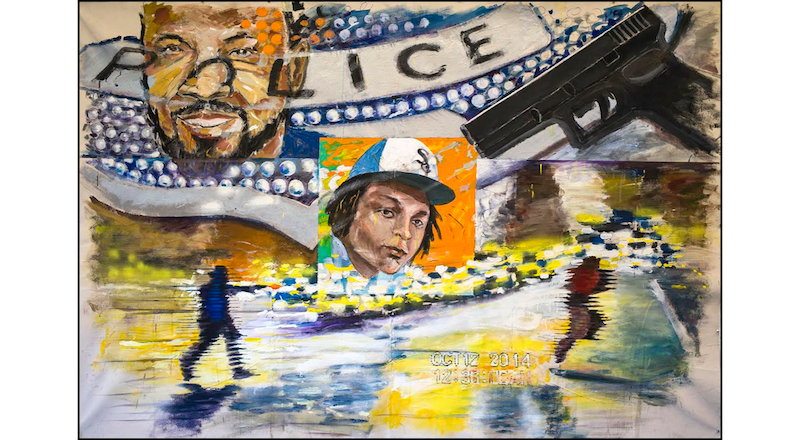 On July 6, 2016, Philando Castile was fatally shot by Jeronimo Yanez, a St. Anthony, Minnesota police officer, just a day after the death of Alton Sterling, 37, in Baton Rouge, Louisiana. Like Sterling's death the day before, which was captured on video by a bystander, the immediate aftermath of Castile's shooting was also caught on camera - in this case, apparently live-streamed on Facebook, where it was reportedly viewed 50,000 times before being removed. Castile's death prompted fresh anguish on Twitter, trending as Sterling's death had a day earlier. CBS Minnesota and other news outlets reported that local police had confirmed the shooting of Castile, who later died at Hennepin County Medical Center. In June, 2017, the officer who shot Castile was exonerated and promptly fired by the local police department. Video evidence shows that Tamir Rice, a 12-year-old boy grabbed a plastic replica gun from his waistband in the moment before a police officer fatally shot him outside a recreation center in Spokane, Washington. Assistant County Prosecutor Matthew Meyer explained how frame-by-frame analysis of surveillance video revealed crucial facts about the November 2014 shooting at Cudell Recreation Center. "You can actually see the gun after Tamir gets shot," Meyer said. "There's a point of contrast on the film that you can see, after Tamir collapses to the ground, the point of contrast appears on the concrete gazebo floor that had not been there before." Both officers had their weapons drawn on Tamir even though we know in hindsight he wasn't a real threat to them. The day before Thanksgiving 2016, Chicago police fatally shot a 19-year-old man during a foot pursuit in the West Englewood neighborhood, police said. The man's family identified him as Kajuan Raye of Dolton. Raye was shot in the stomach multiple times and later died at Christ Hospital from a gunshot wound to the back. His death was ruled a homicide, according to the Cook County Medical Examiner. Raye's family said he was standing at a bus stop with a friend and one other person when police approached them. "The police rode up, got out the car and told them to come to the car and they both ran. The friend that was with him ran the opposite direction, he said he heard four shots,” said Ahkeya White, Raye‘s cousin. White said they ran because they were afraid. Chicago police released a statement Thursday saying an Englewood District sergeant was responding to a call of a "battery in progress." When he got there, he saw a man matching the description of the offender and when he approached, the man ran off, police said. The sergeant told investigators that the man turned and pointed a gun at him two separate times during the chase and at some point the sergeant fired shots and struck the man. Chicago Police Superintendent Eddie Johnson said in a statement Thursday afternoon that a weapon has not yet been recovered. The family maintains that Raye did not own a gun. White said the shooting was not justified. "They actually murdered him," White said. Michael Slager, a police officer in Charleston, South Carolina, shot a black man 5 times in April 2015. A witness filmed the entire incident. Before the video came to light the officer claimed he feared for his life. The video shows the man (Walter Scott) running away when the officer gunned him down in cold blood. In the video the officer can be seen planting something – experts believe it to be his tazer – next to the body afterwards. Slager has been found guilty of manslaughter and has been sentenced to prison. Without the video that was shot by a bystander on his cell phone, we are left to wonder what would have happened to Michael Slager? The shooting of Laquan McDonald took place on October 20, 2014, in Chicago, Illinois. McDonald, in possession of a knife, was shot by Chicago Police Officer Jason Van Dyke from approximately ten feet (3 m) away. After investigation, Officer Van Dyke was charged in November 2015 with first degree murder and initially held without bail at the Cook County Jail. He was released on bail on November 30. Subsequent protests denounced McDonald's death and demanded changes in police and judicial procedure, and for the dismissal or resignation of city and county officials. At the request of Illinois Attorney General Lisa Madigan, the United States Department of Justice initiated a civil rights investigation into McDonald's death and the activities of the Chicago Police Department. It released its report in January 2017, describing the police as having a culture of "excessive violence," especially against minority suspects, and of having poor training and supervision. Video of the shooting shows that Van Dyke was advancing on McDonald, while McDonald was walking astride from Van Dyke when the first shot was fired. The first shot hit McDonald, who spun and fell to the ground. As McDonald lay on the ground, still holding the knife, Van Dyke fired more shots into him. In total, Van Dyke shot MacDonald 16 times in 14–15 seconds, expending the maximum capacity of his 9mm semi-automatic firearm. Van Dyke was on the scene for less than 30 seconds before opening fire and began shooting approximately six seconds after exiting his car. The first responding officer said that he did not see the need to use force, and none of the at least eight other officers on the scene fired their weapons. 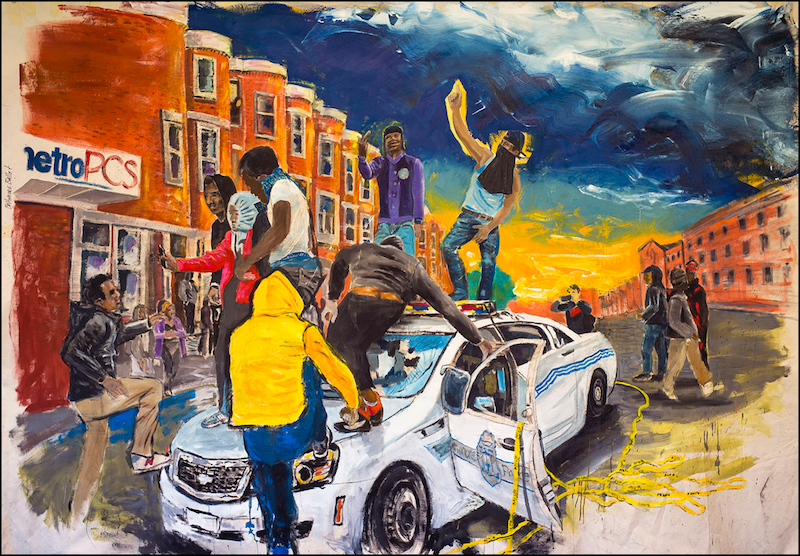 On April 27, 2016, riots continued in Baltimore as a result of the death of Freddie Gray in police custody. Gray's family denounced the violence. "I want y'all to get justice for my son, but don't do it like this here," his mother told journalists. Gray's twin sister, Fredericka, said she couldn't understand the riots. "I don't think that's for Freddie," she said. "I think the violence is wrong." The destruction was so bad that children can't go to school Tuesday. Six Baltimore police officers were seriously injured in Monday's violence, Police Commissioner Anthony Batts said. He said many of the instigators appeared to be high school students. "I think they thought it was cute to throw cinder blocks at police," Batts said. Video showed police in riot gear taking cover behind an armored vehicle as assailants pelted them with rocks. More than two dozen people have already been arrested, Baltimore police Col. Darryl D. DeSousa said. Maryland Gov. Larry Hogan declared a state of emergency and activated the National Guard. The mayor of Baltimore said every possible resource was being deployed to "gain control of this situation." The prize is awarded in memory of Howard Zinn, renowned writer-activist, and champion of free speech, writers and independent publishers. Zinn was posthumously awarded the 2010 Freedom to Write "Thomas Paine Award” which was then renamed to memorialize his lifelong work and dedication. The "People Speak” award recognizes American writers. 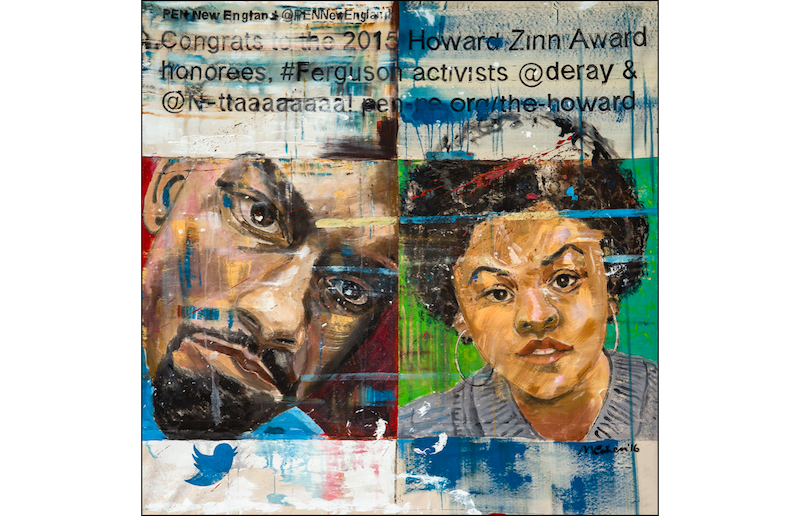 Ferguson activists and bloggers Johnetta Elzie and DeRay Mckesson shared the 2015 Howard Zinn Freedom to Write Award for their work as activists, organizers, and citizen journalists in the Ferguson protest movement. 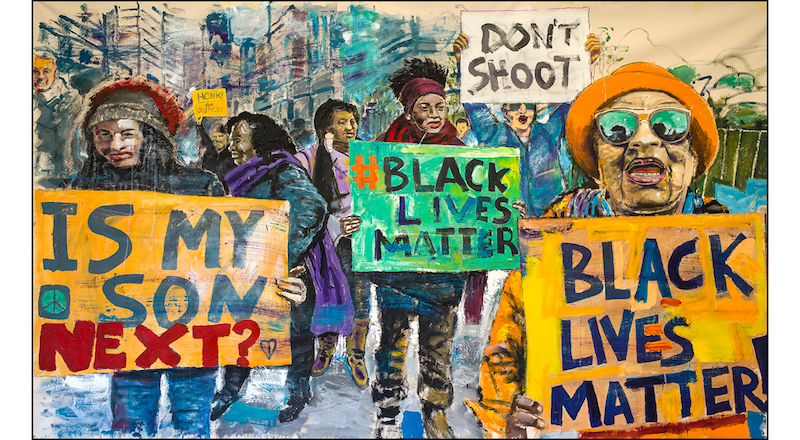 Their reporting and This Is the Movement newsletter engaged and unified disparate voices in the wake of the shooting death of Michael Brown in Ferguson, Missouri. Their activism focused on an enraged community, and has been instrumental in transforming a cycle of tragedies into a movement, assuring that the world would not forget the names of Eric Garner, John Crawford III, Michael Brown, Tamir Rice, and too many others. 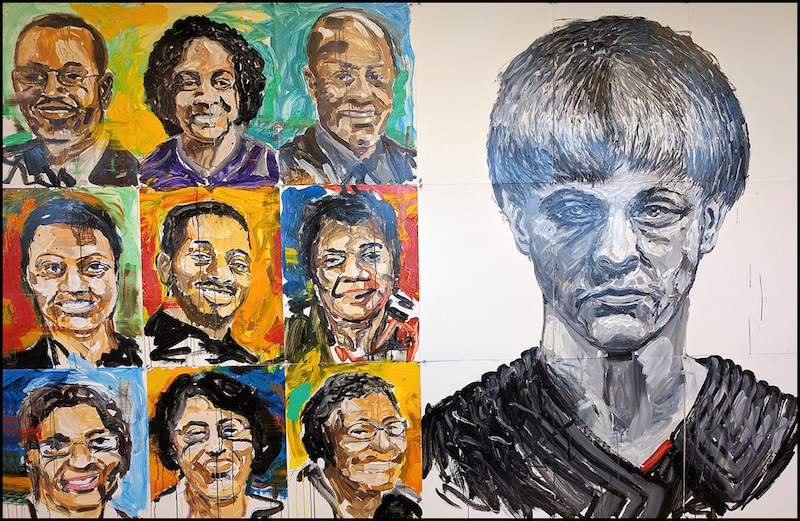 On the evening of June 17, 2015, a mass shooting took place at the Emanuel African Methodist Episcopal Church in downtown Charleston, South Carolina. During a prayer service, nine people, including the senior pastor and state senator Clementa C. Pinckney were killed by Dylann Roof, a 21-year-old white supremacist. Three other victims survived. Roof confessed to committing the shooting in hopes of igniting a race war. In December of 2016, he was convicted of 33 federal hate crime charges stemming from the shooting. Following the shooting, the South Carolina General Assembly voted to remove the Confederate battle flag from State Capitol grounds. On January 10, 2017, Roof was sentenced to death. 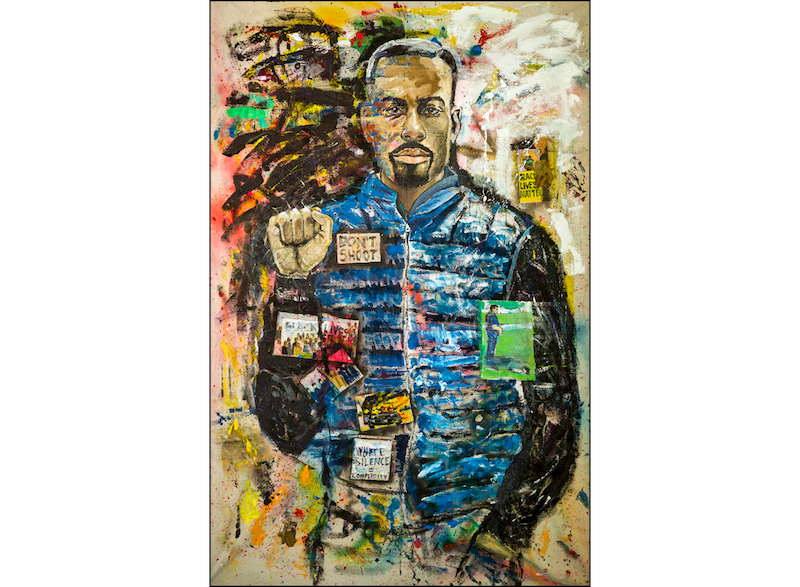 A former public school administrator in Baltimore and Minnesota, Deray Mckesson became a prominent figure in the Black Lives Matter protest movement after teenager Michael Brown was shot and killed by a St. Louis police officer in Ferguson, Missouri. In an extended interview with New York Magazine's Rembert Browne, Mckesson described his unprecedented rise to social media fame, and the ways he uses it to connect with young community organizers around the country. He sports nearly 300,000 followers on Twitter, including pop star Beyonce. This Marion, Indiana, lynching is among several thousand in American history, though unlike most it happened in the North and in a community with little harsh racial antagonism. It also happened "late,” decades after the heyday of late nineteenth-century vigilante violence. Yet the Marion tragedy, like many southern lynchings, was a spectacle lynching. The mob was not content to murder their victims at the jail or to carry them off to an isolated spot. They chose the courthouse square because it was the civic and geographical center of town. The mob deliberately performed their drama on that stage, using lynch ropes as their central props. They insisted the county coroner not immediately cut down the two bodies. They must hang through the night, they shouted, to send a message to blacks who stepped out of line. The promise of the Civil Rights Movement symbolized by Martin Luther King's Selma March, The Civil Rights Act of 1964 and the election of Barrack Obama as President of the United States seems to be eroding. 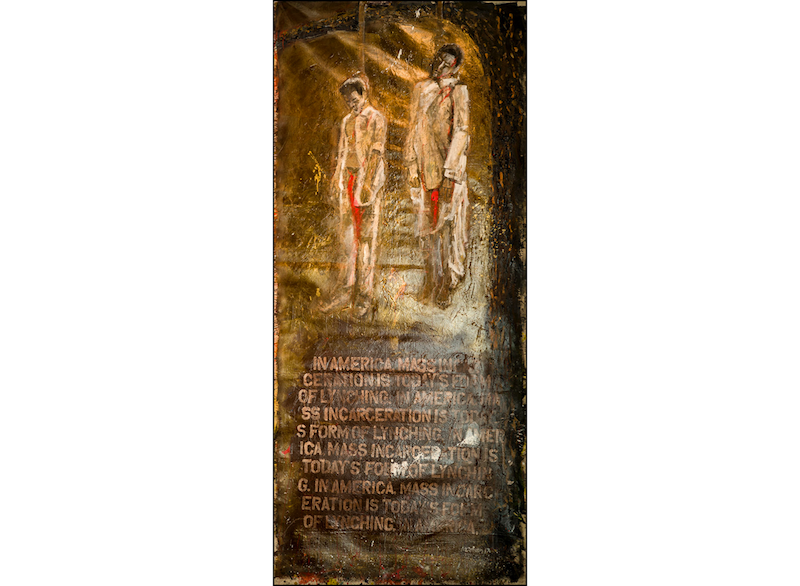 Race in America has gone from Slavery to Jim Crow, and the New Jim Crow era of Mass Incarceration that began with Richard Nixon's election to the Presidency in 1968. Now we use our criminal justice system to label people of color "criminals” and then engage in all the practices we supposedly left behind. People of color, once labeled as a felon, are discriminated against through employment, housing, denial of voting rights, denial of public benefits, and even exclusion from jury service. The question is "How do we confront the critical role of race in the basic structure of our society?” And how do we achieve more equality?